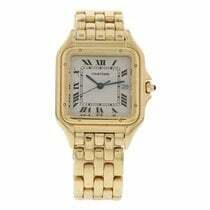 Among the most celebrated watch manufacturers born out of 18th century Paris, Cartier has long been recognized as a master craftsman of the very finest timepieces. The Cartier Ballon Bleu 36mm, a relatively recent addition to the catalogue, is no exception—displaying the Cartier legacy in a contemporary watch of classical character. Smooth, svelte, and seductive, the Ballon Bleu 36mm is a watch of unmistakable form and function, capable of lighting up any room. Characteristic of all Ballon Bleu watches is the convex casing that forms a tactile, pebble-like profile around the watch. Bringing an airy and effervescent feel to these magnificently crafted timepieces, Cartier struck a chord with collectors and the Ballon Bleu 36mm quickly reached the lofty heights at the pinnacle of the horological world. Adding further to the Ballon Bleu’s iconic imagery is the striking blue sapphire cabochon winding crown that is protected by a sweeping metal arc. 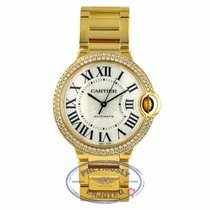 Here, Cartier has created a watch of truly lasting appeal that speaks to collectors of contemporary timepieces the world over. 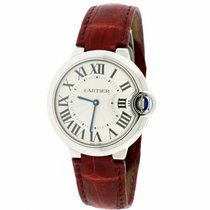 The Ballon Bleu de Cartier watch at 36mm looks elegant on any wrist—male or female. Echoing Cartier’s excellence in fine jewelry manufacture, each Ballon Bleu showcases its own grand aesthetic with the use of materials, metals, and precious stones of uncompromising quality. 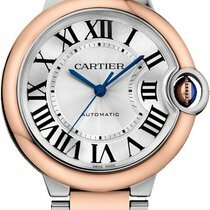 Whether in steel or gold with tones of pink, yellow and white, Cartier’s Ballon Bleu 36mm is sophisticated and showy in equal measure. The silvered guilloché dial, Roman numerals, and sword-shaped hands common to all Ballon Bleu models ensure that the classical aesthetic remains, while a variety of embellishments help give each model its own unique character. With a case dimension of 36.6 mm by 12.05 mm, the Ballon Bleu 36mm is refined, yet robust enough to be worn regularly. Water resistant up to 30 meters and featuring Cartier’s uncompromising commitment to quality, each incarnation of the Ballon Bleu 36mm is manufactured to the strictest standards and built to last a lifetime. The Cartier manufacture is placed firmly within the heart of the Swiss watchmaking industry and employs more than one thousand people. Here, specialist watchmaking skills are prized above all else and the Cartier Ballon Bleu 36mm is testament to this exacting philosophy. Manufacturing includes all elements of each watch within the Cartier catalogue, from initial production to final decoration using advanced technology and traditional craftsmanship. Naturally, this collected expertise is showcased in the contemporary class of the Cartier Ballon Bleu 36mm, a watch of superior design and masterful construction. The Ballon Bleu—a legend in the making.